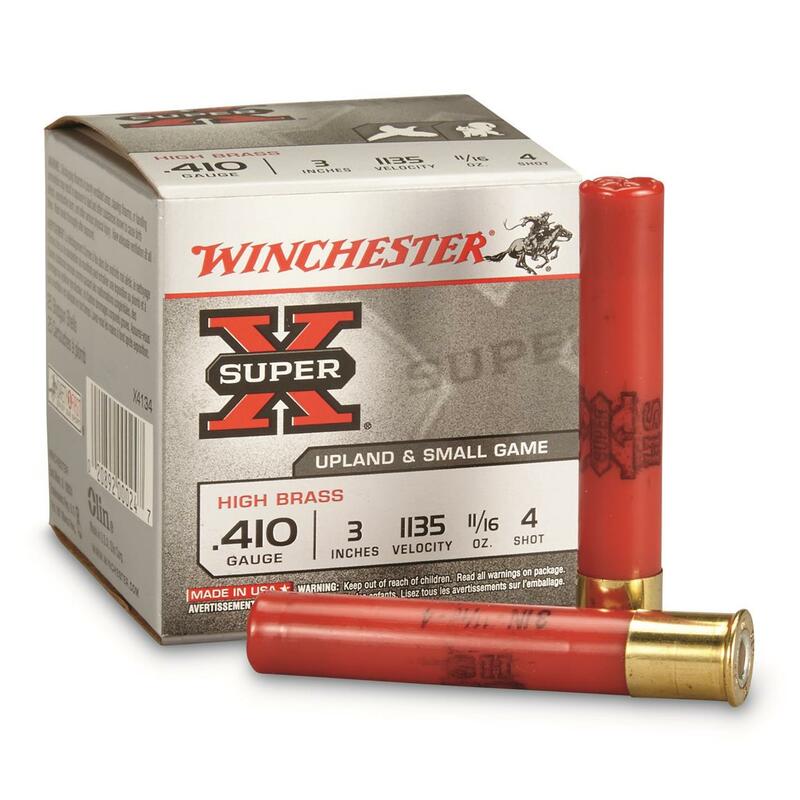 Winchester® Super-XTM High Brass Game Loads for maximum performance in the field or woods, you can depend on. Want better, more dependable knock-down power? Then load up with the legendary Super-XTM ammunition made with the same skill, care and quality as when first introduced in 1922. Today Super-X is made using precise manufacturing processes and the highest quality components to provide consistent, dependable performance that generations of shooters continue to rely upon. 25 rounds. State Shot Size, as available in the Shopping Cart. Order Today! 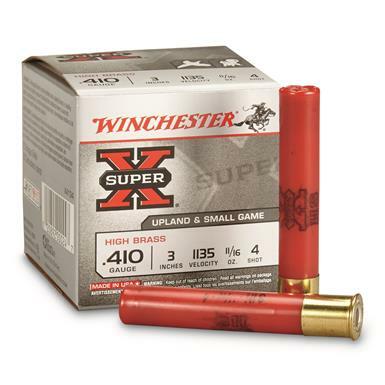 Winchester, Super-X High Brass Game Loads, 410 Gauge, 3 11/16 ozs., 25 Rounds is rated 4.5 out of 5 by 15. Rated 5 out of 5 by Bf2407 from Puts coyotes down! Taken coyotes out to 51yds so far. Patterns better for me in my Benelli SB2 than Dead Coyote. Wish I could find it locally in stores. Rated 4 out of 5 by Bob L from Great service Just what we expected. Good service, good product. Rated 5 out of 5 by Pancho from Perfect for California Quail I've been using this product for a couple of year to shoot Quail in California, since many areas are now regulated to using lead free shot. It shoots a little different since it has a very fast initial velocity. I've had no problems using these to take Quail all the way out in the 40-50 yrd range. Rated 5 out of 5 by Jackl1802 from Great Price After extensive shopping on line I found this item on Sportsman's guide for a great price, and they shipped it out to me very rapidly. I'm very pleased with this company and will do business with them in the future. Remington Express Long Range Loads, .410 Gauge, 3"
Proven performance for all upland game!